Investment is flowing rapidly and visibly into the areas surrounding downtown Chicago. But many neighborhoods, some often just outside these zones of wealthy development, continue to shed jobs and public investment in a cycle of neglect. Chicago Public Schools had an opportunity this year to counteract those forces of inequity in the Near West Side: by committing to integrated schools and ensuring equitable school funding across communities. But in its treatment of Skinner, Brown and Dett elementary schools, CPS doubled-down on the status quo. The district pursued a plan that leads to further inequities and likely worsened segregation, while district officials and politicians framed it as the opposite. CPS followed the same pattern with National Teachers Academy on the Near South Side, and with the addition of a new high school on the Far North West Side. The district’s unequal investments in three schools, Skinner West, Brown, and Dett Elementary, in a mile-long stretch just west of the Loop, magnifies the relation that exists between schooling, real estate and displacement. All three school communities are intertwined and affected by a set of school actions with vast differences in investment. Skinner West, closest to downtown, serves a diverse but relatively middle-class student population, with 23% Free or Reduced Lunch (FRL) and just under a third African American. Skinner West is receiving a $20 million building annex to serve an additional 500 students. Both Brown and Dett Elementary serve a population nearly 90% FRL, and over 90% African American. Yet Brown will get just $5 million for a programmatic investment, and Dett will receive no investment at all. A deeper look at the demographics of the schools and their communities, shows how these investment disparities map onto social inequity. Based on 2016 Census data, half of all children living in the Brown and Dett attendance areas are in poverty, compared to just 6% in the Skinner West area. Unemployment exceeds 20% in the Brown and Dett neighborhoods, while it is less than 5%, close to the statewide level, in the Skinner West community. And while Skinner West has a diverse school population, the neighborhood is far less so. Two-thirds of the population living in the Skinner West attendance boundaries are White. In the Brown and Dett neighborhoods, the population is just over 10% white. Skinner West is an elementary school with a classical/selective-enrollment and lottery magnet program. The program also accepts all students living within its attendance area boundaries in the Near West Side. When it first opened, Skinner did not have a neighborhood component at all, and families living in the area were assigned to Brown. But as the number of wealthier residents in the community increased, they successfully lobbied for the school to open up to the community. The Near West Side is an area now glutted with real-estate development. Office towers for tech-sector jobs, corporate headquarters, and high-income housing are on the rise every other block. Last fall, Mayor Rahm Emanuel attended the local groundbreaking for the Skinner West annex, as he has for many of the other developments in the neighborhood. Rahm has spoken loftily about construction crane records being broken in the city of Chicago, and much of that activity has been concentrated in this one, high-end neighborhood. The mayor has worked to ensure approval of new buildings and zoning changes. The real-estate and development sector have returned the favor through political contributions, helping the mayor stockpile millions in campaign funds. District officials cited increasing enrollments at Skinner West from within its attendance boundary as reason for constructing an annex at the school. Yet Brown Elementary sits “underutilized” just on the western edge of the Skinner West attendance boundary, across the parking lots of the United Center. The district did nothing to boost enrollments at Brown, or to pursue an integration plan. Instead it opted to announce a consolation investment. In 2016 WBEZ reported that a pattern of investments in expanding school capacity in white and middle-class communities instead of integrating schools. Under pressure, CPS proclaimed Brown would become a magnet school, focused on STEM. Yet neither the Skinner West Annex nor the magnet investment in Brown were mentioned in CPS’ facilities master plan. And despite the successful multi-year and bottom-up merger that occurred between Jenner Elementary, in the Cabrini-Green community, and Ogden Elementary in the Gold Coast — a process that city and district officials worked together to obstruct — CPS decided to swiftly foreclose that possibility for the Near West Side. In a twist, the funding for Brown’s $5 million magnet program will be provided through federal “desegregation” funds. The district’s plan for Brown highlights the inequity of the district’s actions further. With the $5 million magnet school investment, Brown will be phased out as a neighborhood elementary school serving the local community. Its attendance boundary will be absorbed grade by grade, year by year, into Dett Elementary School. Students living near Brown but not yet attending elementary school will not be guaranteed access to the magnet program, but instead be assigned to Dett. Dett Elementary, located just a few blocks further west of Brown elementary is no stranger to school actions. Dett, segregated and underfunded, is undergoing its second consolidation in 5 years. Dett is housed in what used to be Herbert Elementary, a school closed by CPS in 2013. And years before that, as part of Renaissance 2010, Dett took in students displaced by the turnaround at Dodge Elementary and by Suder’s conversion into a Montessori. Dett’s old building remains vacant, and is now owned by the Illinois Facilities Fund, a non-profit quasi-government entity that has helped charter schools secure buildings. Despite the consolidation with the Brown attendance boundary, the district has declared no new investments into Dett. The only capital improvement funds the Dett community has seen in the last 6 years is $2.1 million in 2013 when Dett moved into the Herbert building. Meanwhile, their operating budget has been slashed by 31% since then, as enrollment continued to decline. While the schools have faced declining enrollment, residents have struggled to rebuild their communities from the massive public disvestment that occurred when the City tore down public housing in the area. There were over 1,700 public housing units at the former Henry Horner Homes just blocks from Brown. The Chicago Housing Authority plans to eventually rebuild just 600 units for public housing residents, and only a couple hundred have been built so far in the blocks surrounding Brown. While the built housing comes nowhere near replacing what was lost, the population living in the area has jumped in the last several years, driven by an increase in Black residents. The number of elementary school age children living in the census tract has quadrupled since 2012. The population change had just started to impact Brown in the last years, when enrollment was slowly but steadily increasing since 2010. 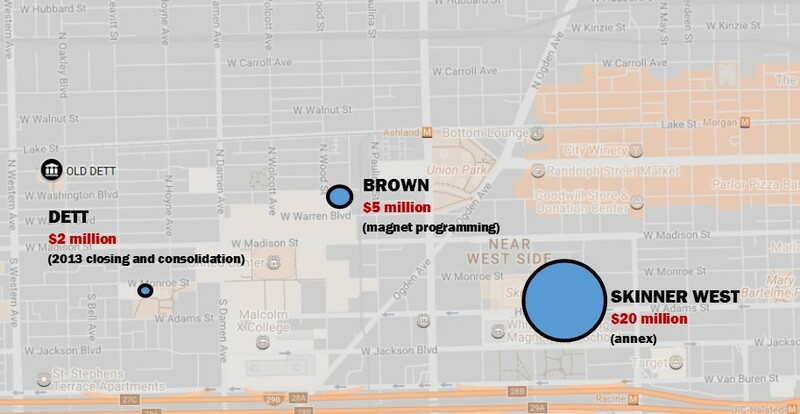 Yet in spite of the neighborhood population increase, CPS chose to invest in Brown only as they shut out future neighborhood students from guaranteed access. Ever since the Chicago Housing Authority targeted public housing for closure, fears of gentrification and displacement have taken center-stage in discussions about change. But CPS top-down actions show how public schools can also be used as the primary lever in displacement and neighborhood change. As the manufacturing district within the Near West Side is refashioned into corporate headquarters and dense clusters of tech-sector jobs, and as the Mayor dangles billions in public tax subsidies to lure Amazon’s second headquarters, the socio-economic divide between communities grows only deeper, and the fears of displacement realer. Once speculation and development hops Ashland Avenue and starts to fill the parking lots surrounding the United Center, will the district then covert Brown back into a neighborhood school, as they did with Skinner West? And will Dett continue to be vastly underfunded, despite serving a community that was once served by three separate schools? The mayor, the school district and local politicians should have worked with all of the school communities to develop a plan that prioritizes integration and equitably funds the needs of students across all three schools. Instead their decisions only add to the opportunity gap while under the literal guise of “desegregation”. community development, disinvestment, segregation. Bookmark.